Over 90% of the Chapter 7 debtors that I assist with auto loans choose to keep that auto while filing a Chapter 7 bankruptcy. This is done through the signing of a reaffirmation agreement which is prepared and provided by the auto lender. The agreement is rather lengthy and filled with unnecessary information and verbiage which is required by the courts. However, the net result of the reaffirmation agreement is simple. The debtor is agreeing to be bound by the terms of the auto loan going forward. The filing of the chapter 7 bankruptcy case eliminates the outstanding debt to an auto lender. By signing the reaffirmation agreement, the debtor is putting him or her back on the hook to be legally obligated by that debt. Most lenders will readily prepare and send to debtor’s counsel a reaffirmation agreement to be signed before the 341 meeting of creditors. However, there are exceptions to this general rule. In most cases the lender will only send a reaffirmation agreement if the debtor is current with their payments. If the debtor is not current, the creditor will typically bring a motion to modify the automatic stay so that it has the ability to repossess the vehicle, sell it at auction and move on. Rarely will a creditor send a reaffirmation agreement if the debtor is in arrears. Further, the creditor is not likely to change the interest rate, monthly payment or total balance due under the reaffirmation agreement. The lender usually wants the exact contract rate paid through a reaffirmation agreement. If there is a non-filing co-signer and the cosigner is making all of the timely payments, then the debtor will not technically have to reaffirm that debt. However, if the co-debtor is a filing spouse, then it is highly likely that the creditor will insist on both debtors agreeing to be bound to the reaffirmation agreement. In some cases we have a situation where a chapter 13 bankruptcy case is converted to one of chapter 7. In those cases, the auto lender was getting less than the contract rate monthly through the chapter 13. Depending upon how long the chapter 13 was pending prior to conversion, the auto lender may be owed a significant amount of money pursuant to the contract. In my experience, most auto lenders will offer a reaffirmation agreement without the debtor having to bring the debt current. There are exceptions to this rule as well. Some lenders insist on the debtor bringing the outstanding contract amount current before they are willing to offer a reaffirmation agreement. Your attorney will be able to negotiate with the auto lender in those circumstances. The key takeaway from this article is to understand that debtors who are current on their autos will have the ability to reaffirm the debt thereon. The terms will typically be exactly what they were prior to filing for bankruptcy. Importantly, the debtor should continue to make the current monthly payment whether or not a reaffirmation agreement is tendered. It is the debtor’s obligation to make payments regardless of whether or not the creditor sends the reaffirmation agreement. There are some lenders such as Ford Motor Credit which will not allow the debtor to simply make payments without reaffirming the debt officially. Most lenders do not take this harsh stance of Ford Motor Credit. Most lenders understand that their goal is to receive payments, not to repossess vehicles. 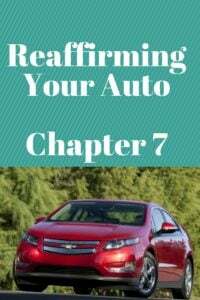 For more information on reaffirming an auto debt through chapter 7, you may contact my office at 847-520-8100. My office will be happy to sit down with you or have a conversation over the telephone to advise you of your rights and obligations under Chapter 7 of the bankruptcy code.